Signing up to go Over the Edge is easy! Register* – Register online and set up your Firstgiving fundraising page. All participants must register online. 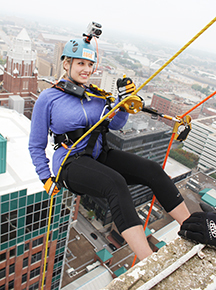 Collect Donations – Participants must raise a minimum of $1,000 to go Over the Edge. Use your online fundraising page to ask for online donations, or collect cash and checks from your network of friends, family and co-workers. Secure Your Rappel Spot – Once you reach the $1,000 minimum fundraising goal, you will be guaranteed a rappel spot and we will contact you to secure a rappel time. Space is limited so fundraise early! Go Over the Edge! – This is a big building…one of the largest in Des Moines. A rappel of 345 is huge by anyone’s standards! *Participants must weigh a minimum of 100 pounds and a maximum of 300 pounds. Participants must be 14 years of age by event day. Participants under 18 will need to be accompanied by a parent/guardian who will sign a waiver.